There are many reason – technical, history, intentional, and accidental – around how we ended up with this set of technologies as our 2017 training and consulting focus. But I think ultimately this works out much less well than Rob describes. Why? Because this first party set of training and consulting offerings leave less space for a thriving commercial ecosystem to develop around a framework. Let’s look at Angular for example. Here at Oasis Digital, we aim to be a leader among many firms around the world, who provide training, consulting, etc. 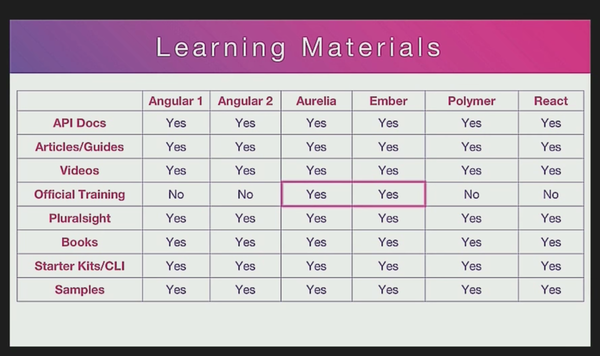 for Angular. Our customers are quite happy with the availability of these services from many different companies; it reduces their risk and means they can shop around for the best fit. Moreover, because Angular has created opportunities for companies like Oasis Digital, it has facilitated a growing commercial ecosystem revolving around the framework. Much the same applies, for example, to React and Vue.js. This is a virtuous cycle. The non-service-offering core team leaves room for others to provide services, which in turn makes it easier and safer for customers to adopt the framework. Of course it would be possible for companies like us to offer training and consulting focused on Aurelia. But we don’t want to do that; we like the people responsible for the framework. If we offered services for Aurelia, we would have an inherently competitive relationship with the company behind Aurelia, vying for the same customer opportunities. This situation applies to various other frameworks and other technical specialties that we could choose to focus on; with so many choices, it inevitably feels wiser to choose those where we can be allied with the core teams rather than in competition with them. I believe that overall, this is quite important in understanding why some frameworks gain enormous momentum and others do not. Creating this kind opportunity for a commercial ecosystem is an immense competitive advantage to those companies who can offer a framework without needing to build a business directly around it – like Google and Angular.